The creamy blend of Mascarpone and white chocolate that is used to fill these tarts is not too sweet, allowing the flavour of the berries to shine. 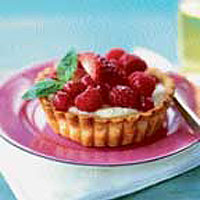 You can make the pastry cases ahead of time and assemble the tarts just before serving. Alternatively, once made, the finished tarts will keep in the fridge for 24 hours. To make the pastry, place the flour and salt into a bowl or food processor. Add the butter and with your fingertips, or by pulsing the processor, rub the butter into the flour until the mixture resembles crumbs. Add the egg yolk and enough water to bring the pastry together. Transfer to a lightly floured board, knead into a ball, wrap in clingfilm and chill in the fridge for at least 30 minutes. Meanwhile preheat the oven to 180°C, gas mark 4. Roll out the pastry and use to line 6 x 10cm tartlet tins. Put them on a baking sheet, prick the bases with a fork and line with greaseproof paper and dried beans. Bake blind for 10 minutes, remove the paper and beans and bake for a further 5 minutes or until golden brown. To make the filling, put the chocolate and Mascarpone in a bowl and place over a pan of barely simmering water until the chocolate has melted. Add the Cointreau if using, stir to combine and leave to cool slightly. Meanwhile, whip the cream until it forms soft peaks, then stir into the cooled chocolate mixture. Pour into the cooled tart cases (you may have some left over) and leave to set for about an hour at room temperature. Top with the berries. Garnish with the basil and serve.